This Sunday, people across the country will gather around the television to evaluate the entertainment value of the newly-released beer commercials and eat chicken wings* and cheesy dips. Many of those people will watch the accompanying football game. Whether you are really into the game or just the commercials and other fanfare, isn’t Superbowl Sunday at least partly about the food? I am not one to begrudge myself or others their favorite snacks at a Superbowl Party. They are All-American comfort food. A typical menu is inspired by Stadium Food, Backyard BBQs and Tailgating favorites, but prepared indoors and served in a manner fit for eating at the couch. I don’t know about you, but my Superbowl Sunday is also Super-Sedentary Sunday. When people around me who are watching the game cheer because the right team has scored, I leap off the couch to high-five/fist-pump/bump chests on cue. That is the only exercise I get the whole day. Even if I am just not that into sports, I enjoy this day and all of the fun it has to offer. The challenge I’ve given myself this year is to make food that completely is worthy of the celebration, and doesn’t send my caloric intake for the day over the top of the high-end of the recommended range for an adult male. I am not saying I am swearing off nacho cheese for life. No, no, no. This is the thing: I have seen those darned, heartwarming Dominos commercials about how they are improving their pizzas and I’m as susceptible to the marketing of convenience and processed snacks as the next person. I have just realized that falling for that message limits the potential for enjoying good, simple food without guilt. Are you with me? 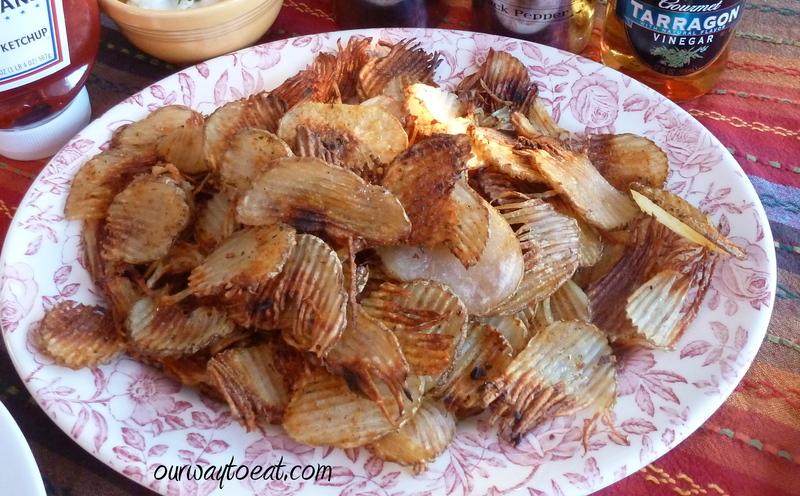 Without further adieu, my version of Oven Baked Potato Chips, a snack fit to eat this Sunday. To make: scrub a couple of Russet Potatoes. 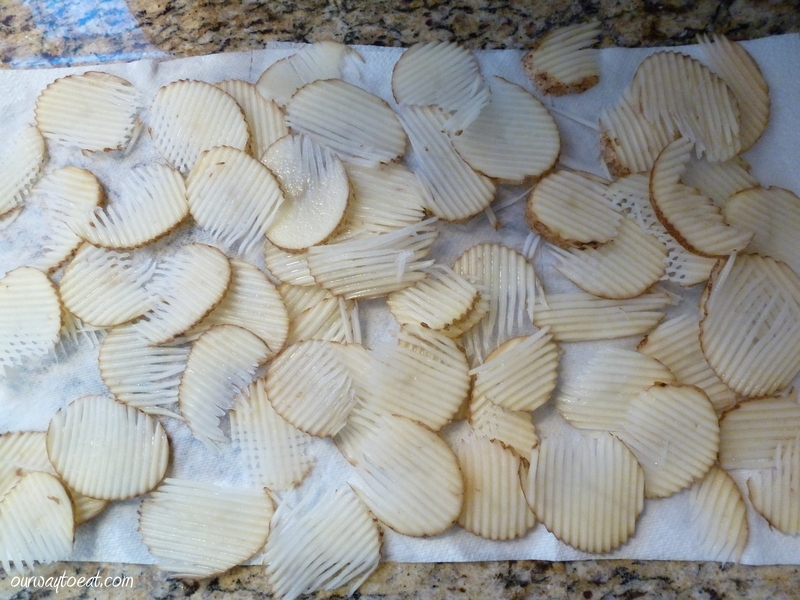 I sliced 3 potatoes and made plenty of chips for the food testers [Meghan and Bjorn]. You can increase or decrease the number of potatoes you use depending on the size of your crowd and how many other awesome dishes you are preparing. I like to slice the potatoes very thin. I used my brand new OXO Softworks Mandoline to slice the potatoes . The Mandoline was a Christmas gift from my brother-in-law. He is a die-hard sports fan, so it is totally appropriate that the Mandoline’s first use is to test a Superbowl Snack. If you have a Madonline, please be very, very careful. This is one of the most dangerous pieces of equipment you can keep in the house, if you ask me. If you use it with extreme care though, the food chopping results are pretty cool. If you don’t have a Mandoline, you could use a sharp knife, or the long blade part of your cheese grater if it is still sharp. I will slice the potato just a little thicker than I did this time on game day. My slices were fine, but as you can see, they had some tattered edges and they got pretty crispy upon baking. Crispy is great, but a little less crispy might be even better. 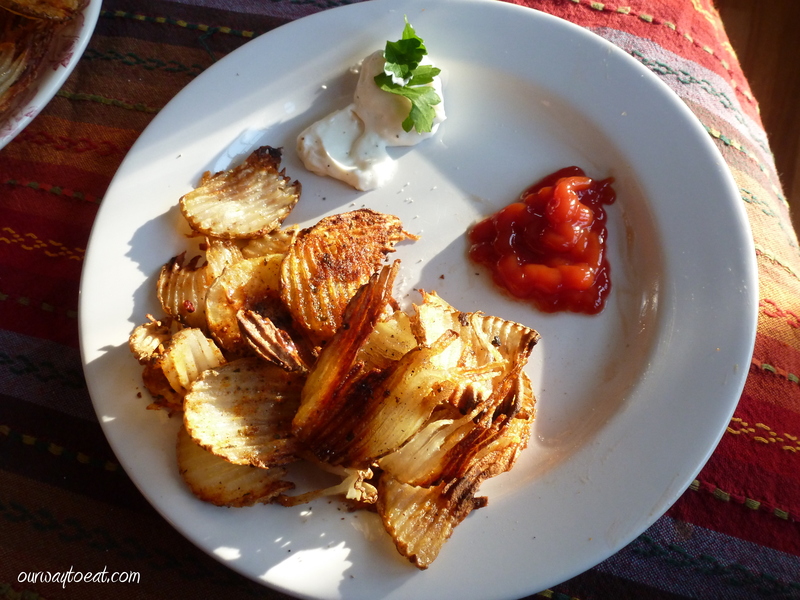 I went for round rippled chips this time, but next time I might do shoestrings, waffle fries, or regular French Fries. The recipe is the same no matter how you slice ’em. Just be aware that when potatoes are baked with little or no oil, the bigger chunks don’t crisp up the same way they do when deep-fried. You have to try it out and see what shape and size you like. 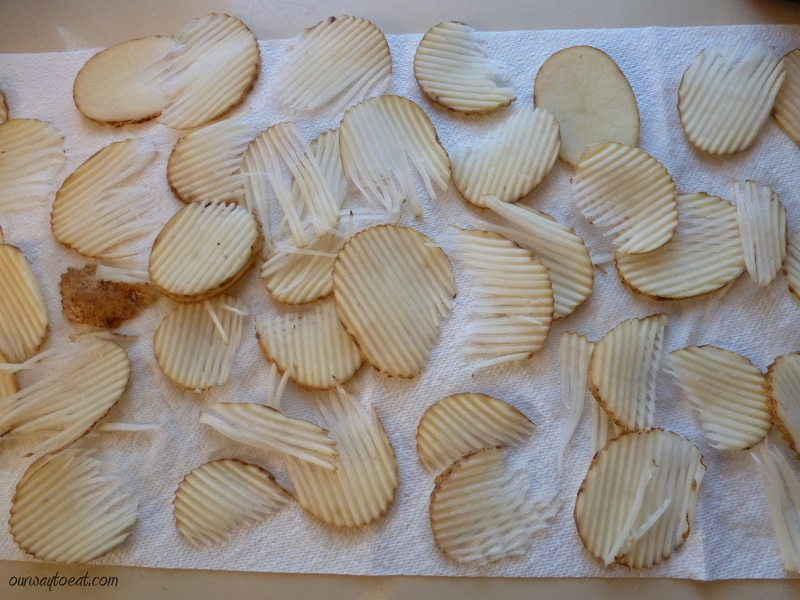 I soaked the sliced potatoes in cold water for a while before baking them. This helps release some of the starch from the potatoes, which helps them get crispier when baked. 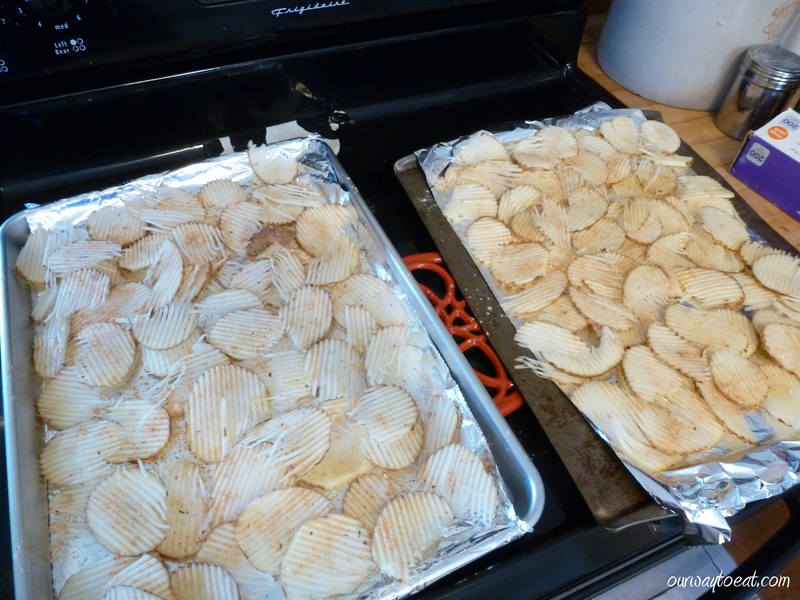 Once the potatoes had a good soak, I dried them off on paper towels and put them on a baking sheet lined with aluminum foil which was sprayed thoroughly with cooking spray. You could toss the potatoes in olive oil before this step, or drizzle them with a small amount of olive oil when they are in the pan, but that is optional. I didn’t and I was totally happy with our crispy baked chips. I sprinkled the thinly sliced potatoes with seasoning. Today I used an envelope of Spicy Hidden Valley Ranch Dressing, oops, I guess I did go ahead and use a processed convenience food. I had it in the cupboard I thought “what the heck?! I’ll use it.” It was good, but I’d be totally happy with a bunch of herbs. I love the combination of herbs in a jar of Poultry Seasoning, or a good shake of 21 Seasoning Salute from Trader Joe’s; if you don’t use a mix, Paprika, Onion Powder, Garlic, Chili Powder and Thyme would also be good… Seasoning is another part of this recipe to adjust to your own personal taste. The seasonings you love will taste good. Notice that I didn’t say anything about salt. I think its best to let everyone salt their own chips according to taste so I put out the shaker when the chips were served. 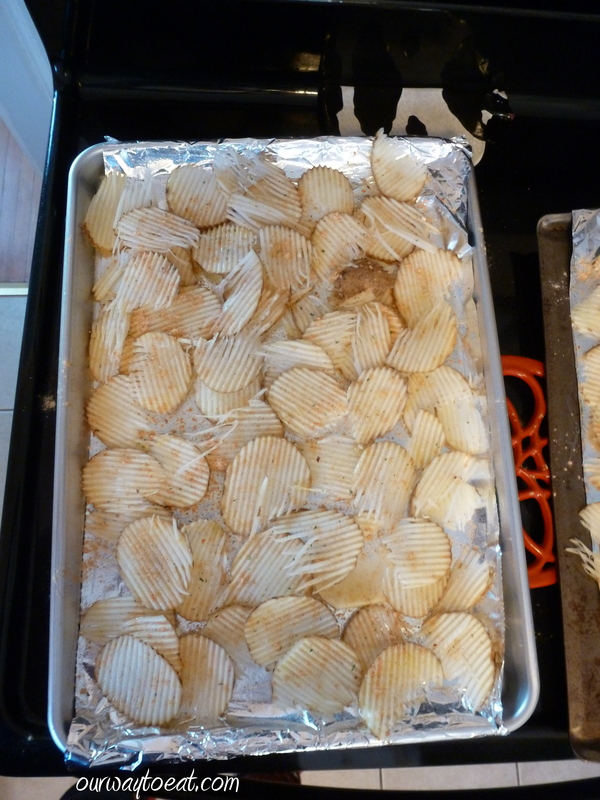 I threw the baking sheets in the oven at 425° for somewhere between 30-45 minutes, tossing the chips once, half way through. I like crispy tatos, so I let them go to the done side and made them extra crisp by finishing the baking briefly under the broiler. Depending on preference, you can bake them until they reach a “tender-crisp” level of doneness. While the chips were cooking, I whipped up a little bowl of “Skinny” Garlic Aioli. All credit for the Aioli goes to the wonderful blog Gina’s Skinny Recipes. My recipe for “Oven Chips” is also heavily adapted from Gina’s recipe for Baked Seasoned Fries which accompanies the Garlic Aioli recipe. The Aioli is made with 2 Tablespoons of Light Mayo, 2 Tablespoons Fat Free Greek Yogurt, 2 finely minced Cloves of Garlic and salt and pepper to taste. This Aioli is a seriously garlicky and kicky condiment. I topped the bowl of Aioli with a little bit of flat-leaf parsley. I think almost everything looks and tastes better when it is topped with fresh herbs. When the fries were ready, I served them on a platter. I set out ketchup, shakers of salt and pepper, and tarragon vinegar. 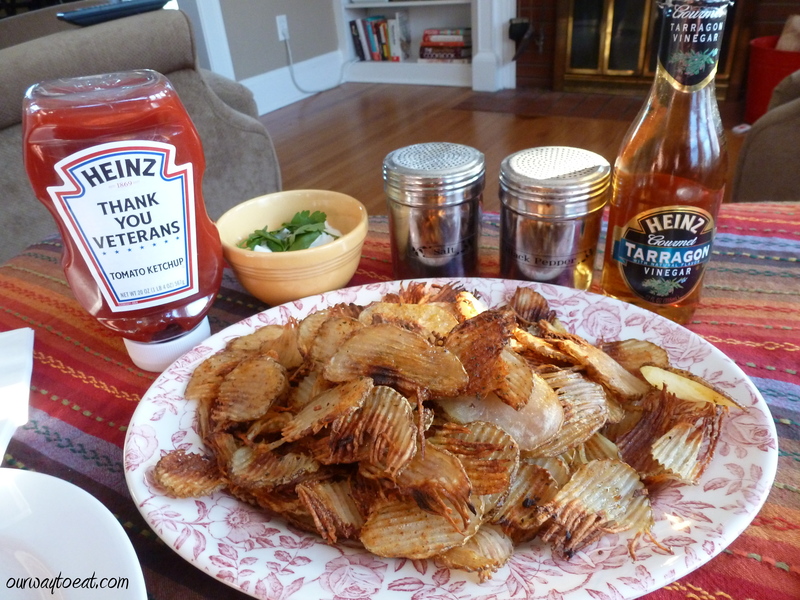 I always serve chips with vinegar. I’m Canadian, so vinegar is a must. Malt vinegar is traditional, but I love using other flavor-infused vinegars to make dressings and cook and flavor food. They add zero calories, you know. We probably eat potatoes once a month or so, and when we do, we often have oven baked chips or fries. They are fit for your Superbowl Party, or any old Thursday night. Try it! *I read that the National Chicken Council estimates that a 100 million pounds of chicken wings will be consumed over the weekend. Holey Moley. That’s a lotta wings.